Those of you who are old enough will probably remember "Airwolf" the TV series. This was an ensemble show with a number of characters led by actors Jan-Michael Vincent and Ernest Borgnine and their technically advanced prototype helicopter with the codename "Airwolf". The series was one of a number of highly successful television programmes created by Donald Bellisario and 4 series of the show were broadcast in the 1980s in a number of countries establishing a large number of fans across the globe. The series had a highly memorable theme tune by composer Sylvester Levay who also created the distinctive music for the majority of the show's episodes. A number of episodes were scored by Udi Harpaz and there were a couple of composers who filled in on occasional episodes, so by and large the sonic shape of the series came from Levay and Harpaz. Like many shows, the music might have faded into obscurity of it wasn't for one obsessive fan, Mark J Cairns. 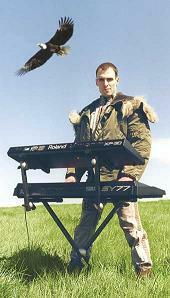 With his synthesisers, Cairns put together his own rendition of the main theme which many people found hard to distinguish from the original. From those small beginnings, a labour of love followed until he had a whole album of material from the show, all recreated by ear without access to the original scores. Further hard work was required to establish the rights to record the music, and Cairns also tracked down Sylvester Levay himself to create some additional (orchestral) tracks for a special double album release. This Limited Edition proved to be very popular, such that it could fetch very high prices on various 2nd hand markets such as eBay. Though the original release is now long sold out, all the music from it is now available to download in mp3 format. So what is the music like? Like the main theme (and some variations appearing in the album) a number of tracks have a regular beat of varying pulses and energy suggesting an engine or the whirling blades of a helicopter, frequently supported by an electronic wash which is very much in keeping with the technological nature of the show. However the album is thematically varied and there is range of moods reflecting the varied plotlines of the different episodes and the emotional undercurrents of the lead characters. Listening to the tracks, those who fondly remember the show will be immediately transported back to the world created by the series. For a self-taught musician, Mark J Cairns has created a remarkable album which showcases not only his own talents but those of composers Sylvester Levay and Udi Harpaz. This is a highly enjoyable listening experience for fans of electronic music fans and fans of the TV series. The original soundtrack CD double album can still sometimes come up for auction but be prepared to pay a high price. 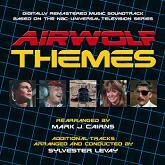 You can enjoy the music in download mp3 format from the Airwolf Themes website, from iTunes and other online music stores. We look forward to hearing about the second album which is now in production. This release fits very neatly into our Electronic Music category. Check out the mfiles Electronic Music article for an overview of some of the main developments in electronic music, and other recommendations from the genre.